Writing that title makes me remember my self-scripting teacher in undergrad, Rosemary Quinn, and how she would so clearly and ritualistically STATE the date at the opening and closing of each of our sessions. It has stuck with me. And its funny, I use it for all sorts of things. When I’m having a sad or rough patch in my day (or week or year for that matter), I tend to find some sky to look up at, and I say to myself the whole and complete date…outloud. When my schedule gets out of hand and I’m not breathing so well, I sit really still and look around wherever I am, notice it, and STATE the date. Anyway, this is my first blog post about my new artistic endeavor about women and water and unisonance and a hodgepodge of other things that I have both close and utterly foreign relationships to. I am more excited but less self-assured than I’ve perhaps ever been when starting to really begin the process of publicly talking about a new work of mine, so in response, I hereby am stating that TODAY is April 6th, 2010. There will never be another April 6th, 2010. And this is what I’m engaging myself in. POW. I tend to work out alot of design elements in my head before setting any movement or action with the performers, and tomorrow I’m doing a little photo shoot that will hopefully yield a killer publicity shot and also a specific and inspiring image for me to work with. For my last show, I understood what the “world” of the piece looked like very early on in the building process, and it really shaped everything about how I worked, so I’m kind of feverishly searching for that clarity about this new work. I’ve been paying lots of attention to structures and architecture, looking closely at interior design and set design, and frankly spending a more-than-usual amount of time at the MOMA, looking at pieces for inspiration. I feel like once I’ve got my set design somewhat locked in, I’ll understand so much more about the movement vocabulary and the other elements of the performance. so thats high on my list. I’m also anxious and excited to get the performers/collaborators into the studio. I am mega-lucky to be working with the same three women that built Total Facts Known with me (Julie Phelps, Shawnrey Notto, and Maryam Rostami) and I’ve added Loren Robertson and Anna Whitehead to the mix. All five folks are pretty brutally smart and brave, in my esteem, and I’m feeling pretty aware of just how great this ensemble is going to be. Which feels good. On that note, I’m excited to get them into the studio, because they have such amazing art-making brains, and I’ve actually gotten to the point, where I need some outside perspective and some visuals of my ideas on other bodies, as I’ve been thinking mostly to myself about this work for almost a year now. and….i feel like, for right now, I’m kind of avoiding the politics of this piece, and I don’t know why. i mean, basically, we’re taking stories of distinctly women’s experiences, splicing them into a structure with texts about the existential woes of man (beckett and miller play texts), and adding a bunch of often clownish, often violent, often confronting movement sequences and tasks. Am i curious about the simple moment of women doing canonically male texts in a queer compositional structure? yes. Am i having a crazy deep moment of self-reference where i try to locate my misunderstood gender identity in this aforementioned concept. yup. will it be creepy and appropriating or self-depricating or boring or simply a non-event? maybe. but…i honestly feel like these are conversations that’ll bear alot more fruit once the work starts to really shape up. i’ll keep “you” posted. -is the cast structure two pair and one soloist or just five folks who float in and out of permutations of five? -how much is this piece about race? how in control do i need to be compositionally of that element? -do i need a stronger or clearer central theme or narrative? will that arise from deciding on specifically what pieces of the text im using? -what the HELL is going to become of this scary and strange moment/intersection of me directing five women? do i need to do something specifically different? -what does this show look like? big logs dipped in gold paint? a dilapidated bus? colored christmas lights? bare stage? some kind of large conceptual paper structures? a picnic bench? 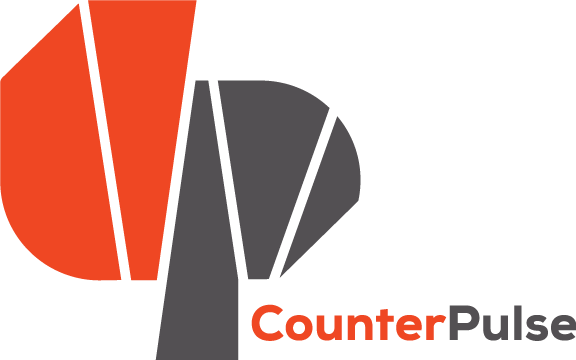 I’m already feeling profound gratefulness to CounterPULSE. I’m already feeling critical and afraid of this piece and I already totally like it. Here we go…..wheeeee…..